Queen Mae and the Bells, formed in 2005, includes Tina Matthews, Eve Warnock, and Gendala Kelli Anna. The three artists initially got together to explore conceptual performance art which turned toward a completely unique artform. With no true fit in any genre, they mashed together 'Experimental Folk Opera' to give some footing to their viewers. 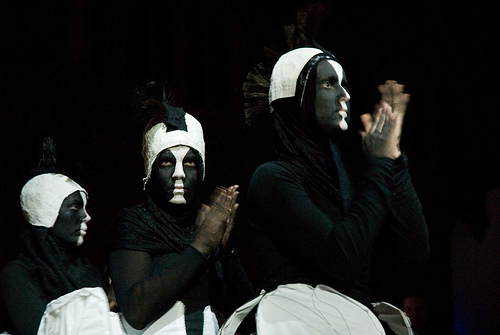 Performances often include story-songs embedded in a continuous soundscape and activated with live instruments, voice, and objects as instruments. Most recently, the group has moved toward adding live accompaniments to original soundtracks, often composed by Matthews. QMB members are currently based in Los Angeles, CA, Oakland, CA, and New York City. Tina Matthews. Eve Warnock, Gendala Kelli Anna, and Nathan Ober shooting a music video. Queen Mae and the Bells: Eve Warnock, Tina Matthews. Gendala Kelli Anna.